'Dramatic' in no way overstates the crossing of the Larkya La. Towards Larkya La, an hour from the top. The Lonely Planet is unequivocal in stating that "the Larkya La is one of the most dramatic pass crossings in the Himalaya". 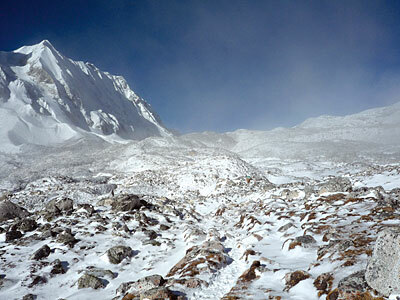 In every sense, the 5,200m pass is the high point of the 18-day Manaslu circuit. To get into position to tackle it entails following the Budi Gandaki River to its origin in the Himalayan glaciers. The trail, starting from Arughat or Gorkha, is rated as arduous but the rewards of experiencing Nepal's rich cultural diversity first hand are hugely satisfying. On Day 13, we set off from the last camp at Larkya Phedi to cross the pass. 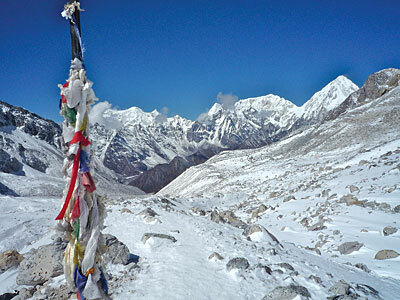 Larkya La is not the highest of the trekking passes of Nepal, but it carries its own challenges and dangers, not least because of the need to commit to a 10-hour day, including four or five hours at altitude on rough and exposed terrain. The pass is also notorious for sudden storms. A day before our crossing, snow had erased the trails but we woke up to a gloriously clear sky. It didn't make it any easier. The pass is not sharp-edged, but just seems to go on and on. I could see the prayer flags on top for a long time before I got to them. As I ground it out, large Himalayan peaks started to appear to the left and right and from the top, I was completely surrounded and indeed emotionally overwhelmed by them. A long 1,700-metre descent led to the campsite at Bhimtang, a sublime high alpine valley, itself surrounded by Himalayan peaks. The spectacle of amazing peaks continued most of the next day, as we dropped down the valley of the Dudh Khola to meet the Annapurna Circuit trail at Dharapani, on the banks of the Marsyangdi Khola. Yes, dramatic in no way overstates the crossing of the Larkya La! At 5,200m, and just about to begin the long descent to Bhimtang. A mani wall at Bhimtang. 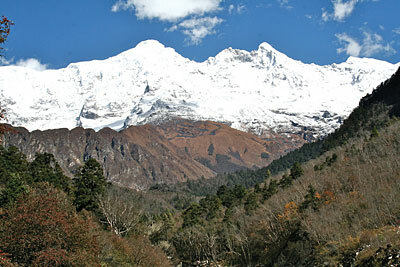 Namjung Himal (7,140 m) dominates the skyline. Glacier from Namjung Himal below Bhimtang. Above the Dudh Khola. 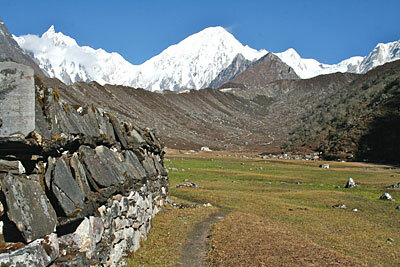 Manaslu (8,156m), on the left, dominates. There is no other ways to up lift the life style of hilly region's people without promoting tourism. Many peaks in the high himalaya from east to west in the norther part of the country to be recognized and should open for the new trekking routs. But concern authorities are not doing so. They seem to be slept in the eve of Tourism year 2011. Obisously the many thanks goes to the writer who has briefly written about Lyarkya La. 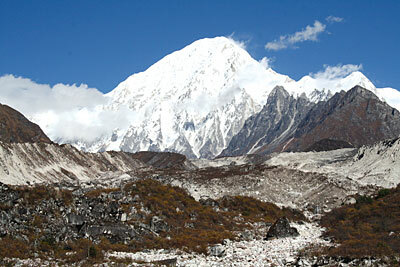 La means snow peak or snow hill in Himalaya's various languages. The correct word is Lhargyal La. It means victory hill. Similarly the Sangri-la is also written in incorrect way. It's correct is Sangey Rhi La. The meaning of Sangey Rhi La is Heaven hill. Sangey means Buddha or peaceful. Rhi means jungle or place. In other word Sang means Dhoopi and Rhi means forest or having Dhoopi jungle where natural perfume can be found. Therefore, people who are involving in tourism sector should write in correct way of the proper name of those places in respect of the local anguages. Without writing local languages correctly, it does not give sound meaning. Once we have done wrong but such wrongs should not be repeated.